If you're searching for residential elevators, home lifts or domestic elevators in Melbourne, Sydney or Brisbane - look no further than your local residential elevator specialists at Next Level Elevators. Home lifts are an excellent way to add a touch of luxury to your Sydney, Melbourne or Brisbane home or overcome mobility challenges and keep you in your own home longer. Next Level Elevators Sydney and Melbourne showrooms have the largest displays of operational elevators in Australia with friendly expert staff on hand to answer any questions and help you choose the best domestic elevator for your home. If you'd like to learn more about the best residential lifts available in Australia, get in touch with Next Level Elevators today. 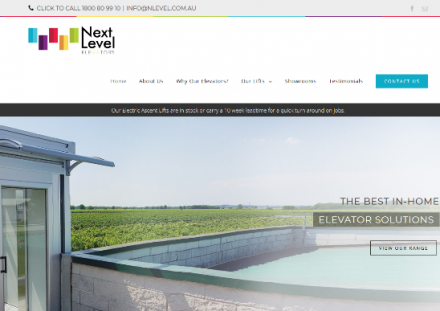 Description: Next Level Elevators – Lift Services in Melbourne, Sydney & Brisbane. We always have lifts in stock and boast short turnaround times from hand-shake to installation. Atlantic Elevator Sdn. Bhd. (Popularity: ): Manufactures and maintains elevators and dumbwaiters. Contains product details, client list, and company information. Everything Elevator (Popularity: ): Contains news, auctions, jobs, and directories. E.A. Foulds Limited (Popularity: ): Offers elevator manufacture, maintenance, and refurbishment. Contains a description of products and services. Matot Inc. (Popularity: ): Manufactures residential elevators and dumbwaiters. Contains products, customer service, and a list of distributors. Stannah Group (Popularity: ): Manufactures and services passenger and freight elevators, and dumbwaiters. Describes products, applications, technical information, services, and news. Kone Spares (Popularity: ): Offers spares for manufacturers including Montgomery, Kone, O&K, and Armor. Contain online shop. Adams Elevator (Popularity: ): A manufacturer of elevator and escalator parts, fixtures, and safety equipment. Includes products, tools, services, jobs, and company information. Gillespie Corporation (Popularity: ): Manufacturing, design, and construction of sidewalk, pitless, hydraulic, and passenger elevators. Includes product descriptions and technical drawings.